Home Staging Portfolio Photos – Hire a Professional or DIY? As home stagers, the quality of our home staging portfolio photos is so critical to our success in attracting new staging and redesign clients. “Should I hire a professional property photographer to do my before and after photos? I’m worried about how much time I would spend taking the photos going home and sorting through the best ones. 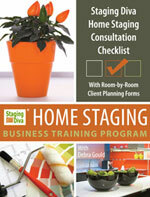 She raises some interesting points about building a quality home staging portfolio. I’ll share my point of view on this and I’d love for others to jump in too with their thoughts! One of the difficulties of involving a third party in your home staging portfolio, in this case a professional photographer, will be coordinating his availability with the opportunity to shoot the “before” pictures. So by the end of my home staging consultation, there is no real “before” anymore. My transformation has begun and the house doesn’t look like it did when I arrived. The “after” shots can be tricky too, but less so because the job is complete and hopefully the staged home will look that way for more than a few days. Of course this is never guaranteed, especially if the home sellers are still living there while the home is on the market! If you’re having the photographer come in on a special day to shoot before and after photos, you’re asking your client to do you a huge favor at a time when they are already stressed out. What’s in it for them to make their photo-ready property available to you on two separate days? Then there are the situations where you give home staging advice and they do the staging themselves. I explored whether you can still use the property in your home staging portfolio here. Another approach would be to shoot your own “befores” and a hire a professional photographer to shoots the “afters.” The problem is this might make it look like you’re cheating to exaggerate the results. In other words, the marked difference in photographic quality between the before and after will distract people from noticing the quality of the staging itself. It will look like you’re using worse photography for the before to artificially enhance the transformation. Not unlike those before/after shots for wrinkle cream ads. In the before, the woman “of a certain age” looks haggard like she has insomnia and got stuck in traffic on the way to the shoot, where there was no time for hair and makeup. Harsh lighting only makes her look worse. Then the after shot is a wonderfully-lit soft focus photo of a well-rested woman with professional hair and makeup. Even without the wrinkle cream there would be a marked transformation between the before and after. You don’t want your staging photos to look like the only magic is better photography! To the Staging Diva students’ original assumption that hiring a professional will save time, I don’t think that’s true. A professional photographer doesn’t just walk in and shoot the rooms in two seconds. He will have lighting and reflectors that need to be set up and taken down. If he’s a true professional, he will also be obsessive about the detail in each shot, which takes time. However, since his “job” is photography and your “job” is home staging, you might pay even more attention to the staging details in the photograph. Hiring a professional doesn’t eliminate the need to sort through the photos to decides which ones you want to use, though it might eliminate the need for you to spend time on retouching for the ones you select. Once you get comfortable with retouching tools however, you’ll find you can fix a photo yourself in 1 to 5 minutes. With all the coordination needed to book this professional, negotiate permission with the client, tweak the rooms when you get there because it doesn’t look quite as nice as when you first staged it, etc., I doubt going this route will save any time anyways. At most, I would reserve using a professional for really exceptional properties, not most of them. This might be an especially large or expensive home you’ve staged that you want to make the central focus of your home staging portfolio. On the other hand, there are at least two dangers in that too. If only some of your shots are taken by a professional, the rest of your portfolio won’t look so good by comparison. Also, you don’t want to give all your portfolio over to an exceptionally large or expensive home unless you feel you can attract enough of those clients. The average client should be able to see their needs reflected in what you do too. Personally, I believe home stagers are better off investing in a quality/easy-to-use camera and then practicing taking their own home staging photos. You can even start a home staging portfolio before staring your home staging business. When you DIY, you’re never at the whim of another person’s schedule. Plus you’ve empowered yourself to be in charge of one of your single most important marketing tactics. You should invest in your home staging portfolio, but that doesn’t necessarily mean investing in a professional photographer to shoot it for you. Aside from the disadvantages mentioned here, hiring a professional photographer could get very expensive too — $200 or more per house! If you’re planning on getting the real estate agent to cover some of this cost so they can use the shots for MLS, make sure all possible uses are part of your deal with the photographer, otherwise you could find yourself in copyright trouble. I tend to be biased towards the “do it yourself” school of thought. This has been a strength in growing my various businesses since 1989, because I’ve always kept my costs close to zero, and my profits close to 100%. Plus, I never had to be at the whim of someone’s priorities or schedule because I maintained total control. If I’m in the client’s home and it’s photo-ready, I pull out my camera and get busy taking the shots I’ll need for my home staging portfolio. At the same time as I enjoy that control (and lack of expense), I readily admit going overboard with DIY can also be a weakness for a business owner. It means I continue to do things (that aren’t the best use of my time), longer than I should. I don’t believe photography fits that category for the reasons I mentioned above. What is your point of view on hiring a professional photographer to help build a quality home staging portfolio? Please share your comments and questions below, I’d love for you to add to this discussion! I agree Debra, I have signed up for a professional photography 6 week course on how to get to know and understand your digital camera again! It’s a 6 week course 1 night a week for 2 hours – huge savings through my Gardening Club inner circle of friends. Absolutely DYI! I’m much more invested in the results of the b and a’s and would rather be in control of showing off my results. I’ve been shocked at how many times the “professional’ pictures were not nearly as flattering as my own were. The photographer’s goal is more about showing the size of the rooms than highlighting the staging. Lisa you raise good points. Thanks for commenting! I take my own before shots and either get the photos that the real estate agent’s professional photographer takes or hire a photographer to take my after photos. Regarding my before shots with occupied properties, I too sometimes get caught up in the staging and forget to take photos, but I always make an effort to take photos before I or the homeowner does anything. I tell the homeowner I am taking photos so that I can remember the details should I need to answer a question they may have or if I need to refer to them if they end up hiring me to do something, e.g., adding rental furniture, shopping for bedding and accessories etc. Of course I disclose verbally and in my consultation agreement that I will use them for my own marketing purposes. I don’t take after photos of properties where the homeowner has done everything. I take after photos of properties where we’ve made a dramatic enought difference that I want to include the photos in my portfolio. With vacant properties, I take my own before photos which we end up fixing up as much as possible before we use them. They will never look as good as the one’s our professional photographer takes for the after shots. While my assistant is very good with the camera and with editing, there is a marked difference between his after photos and a professional photographer’s, so that is why I either get the shots from the real estate agent (or his/her photographer) or I hire my own. The lighting, I find, is the big difference. An entire room will look well lit, whereas in our DIY photos, it is hard to light distant corners. Forgot to mention the time involved. When I hire a professional photographer, I provide him with a link to dropbox.com to the before photos that I want after shots of. This way he knows which angles to shoot. Yes, there is some time involved in sorting through both the befores and the afters, but it’s not that much and it’s well worth it to me. Donna, Thanks so much for sharing your experience with everyone. Most helpful! Also explains why your after shots always look so fantastic, not just the transformation, but the quality and lighting of the photos! Sharing the before shots with the photographer via DropBox is a great idea to ensure the same vantage points are included. I believe in DIY unless it is totally out of my expertise. Taking the photos yourself will save lots of money and you know what to pay attention to as a homestager unlike the photographer who might not have the time and patience. Thanks for weighing in on this debate Sally! Appreciate you commenting. Janine, isn’t it cool to see your photo show up next to your comments?! Good for you for taking action. Hi great article Debra!I like the sound of taking your own photos but as a newbie and not the best at taking photos, can you recommend a great digital camera that would be good for me to use for my before and after pictures? I’m not happy with the camera that I have.Thank you! Thanks for commenting Kim. You’ll find this article I wrote on Camera Buying Tips for Home Stagers helpful. As a professional real estate photographer, I have to say that what Sally said is totally true. What I do for a realtor is different than what I would do if a home stager hired me. 1. Have a list of “must have” shots for them – you know the property, and you know your website – direct me! A pro photographer won’t be offended if you have details! 2. Make sure it’s ready when I arrive. Try not to arrive at the same time – get there 15 minutes early to make sure the owners kids haven’t destroyed your perfect sofa staging! You’re wasting your money to have me stand around and watch you finish up! 3. Trust me when I say a shot won’t work! I have 11 years of experience behind the camera – many people with less experience don’t necessarily understand the difference between what your eye can see and what the camera can see. That being said, if you REALLY want to see the shot, you’re paying the bill so tell me you want it anyway! Fantastic tips Greg, thanks for commenting!